This year, we wanted our beautiful window looking out onto Monument Square to reflect our colorful and fun personality as well as invite anyone and everyone to come in for a bite to eat at Sisters to experience our great food, atmosphere and fun-loving sisters that help to serve up delicious sandwiches every day to the people of Portland. To achieve this goal, we sought out the help of Tamara Jones, a Portland, Maine based artist and designer. 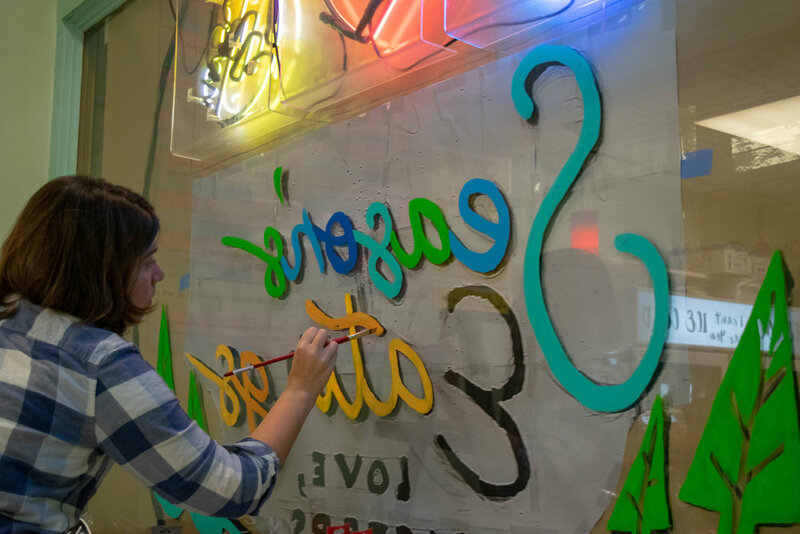 This was her first time painting a public window, and we think she captured the Sisters brand amazingly. From Tamara: “A majority of my art consists of oil landscape paintings, but I’ve done everything from drawn illustrations to graphic logo designs. This is my first attempt at painting a public window and I think it turned out quite well! As soon as I knew I was going to be creating the Sisters’ window I knew that I wanted the design to feel like a giant holiday card from them to the community. To communicate their fun and playful vibe I made sure that their iconic neon sign (Peace Love & Sandwiches) was an integral part of the design. A magical snow globe seemed perfect to both highlight the message and draw attention to what’s happening inside the shop. The trickiest part (besides painting backwards and in reverse from the inside of the window) was working around the fixed eating counter at the window. Anticipating the issue, I created a paper template to ahead of time to make sure I got the curvature of the globe right where it needed to be. I have to say, the best part of the piece is that when customers are seated at the counter enjoying their delicious meal, they help complete the painting by being inside the snow globe! It was an absolute blast creating this window! I’m so happy with how it turned out, and the response I’ve gotten thus far has been fabulous. We are so happy Tamara was able to really embody the Sisters vibe and brand, and we can’t thank her enough for taking the time to plan and execute such an amazing window design! Next time you’re in the area, stop by our window and pose for a photo tagging #peaceloveandsandwiches when you share it! We’re open every day, and Tamara recommends the Macintuscan sandwich to anyone who stops in - what can we say, it’s a crowd favorite! You can reach Tamara on Instagram at @TamTamStudios and her website is www.tamara-jones.com.